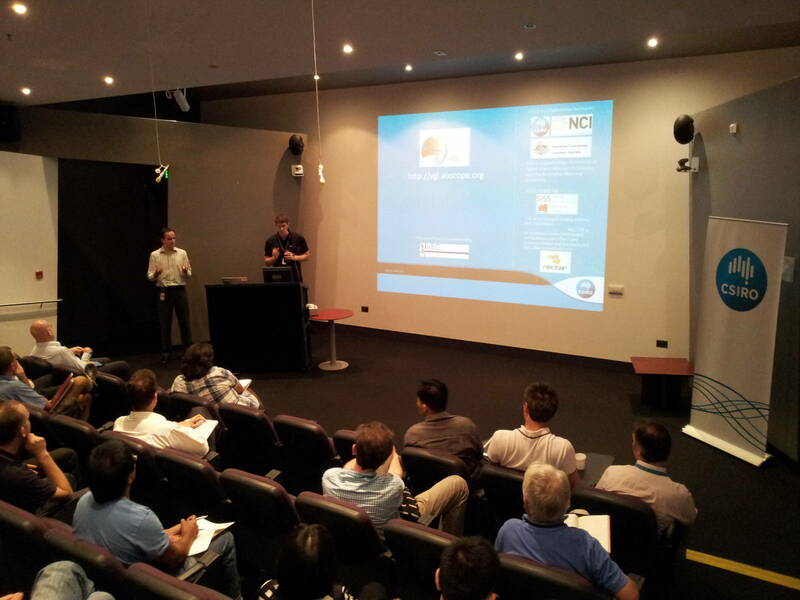 Its official...VGL v1.1 was launched last week (Friday 15th February 2013) at the Australian Resources Research Centre in Kensington W.A. The Launch included a presentation and live demonstration of the VGL using multiple workflows to support things such as Geophysical magnetic inversions and geothermal modelling. The Virtual Lab supports several workflows now and includes codes for processing - Underworld, eScript and UBC and an extensive Geophysical data collection from Geoscience Australia and the Geological Survey of W.A. It is our pleasure to announce the full release of the Virtual Geophysics Laboratory (VGL) v1.1.1. 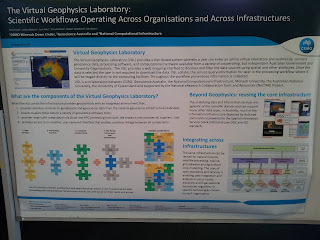 The VGL is a scientific workflow portal that provides Geophysicists with access to an integrated environment that exploits eResearch tools and Cloud computing technology. It is a collaboration between CSIRO, Geoscience Australia (GA), and the National Computational Infrastructure (NCI), and has been funded by the Federal Government's Education Investment Funds through NeCTAR. A newly streamlined user interface. Support for multiple scientific codes (eScript, Underworld and more) across multiple cloud providers (NeCTAR, NCI). Much more data is being provided from additional organisations. The Development team are pushing hard to iron out the final bugs within the VGL v1.1 and have pushed out the RC2 for testing. Providing this candidate passes internal and external stakeholder tests, this will be rolled out to production. The intent is to roll V1.1 out to production before the Holiday season break and have a formal public release of the VGL once more data is made accessible to it from GA by late January. Time is racing by and we are full-on into development of the next release of the VGL (v1.1). This will be an exciting release as it will open the Virtual Laboratory up to a larger research audience. The release will include software packages such as Underworld (from Monash Uni), eScript (UQ), UBC and possibly a series of others. The team have been working hard addressing stream-lining things and the contributions from our new staff member (Richard Goh) have been very valuable. Well its official, we released v1.0 of the VGL on the 30/7/12 and immediately we're getting requests to get access. Unfortunately, due to a licensing issue with the underlying computational code, access is restricted to persons from Geoscience Australia. This will be fixed in the subsequent v1.1 which will see additional open-source (no license restrictions) computational codes added. For all those with an interest, please be patient and the v1.1 release, due out 30/10/12 will open access to you! Though the first blog for this project, we are now technically 2months into the VGL Project. After various contracting issues, CSIRO has signed onto the NeCTAR sub-contract and is the lead agent in the Virtual Geophysics Laboratory project. 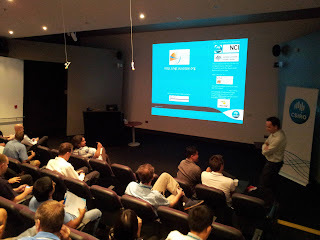 For more specific details about this project, check out here - https://www.seegrid.csiro.au/wiki/NeCTARProjects/WebHome. The project aims to open access up to HPC and Cloud resources to the Australian Geophysics community via a web interface and service infrastructure. Last week I kick started things by running a series of presentations around Aust (presentation available at: https://www.seegrid.csiro.au/wiki/pub/NeCTARProjects/WebHome/Fraser-21June12-IDLE-ARRCv2.pptx) with the intent to increase interest in the development. Response has been strong and hoping we can persist it. Josh Vote, Terry Rankine and myself will run things from the csiro side, with assistance from NCI, GA, Monash, UQ and ANU. 1st release will be to a restricted audience on the 30th July 2012, with a subsequent v1.1 release to the general public on the 30th October 2012. Final thing to note is that we are recruiting for a software developer to assist with the project - if you're interested contact me!